Lily purchased 2.5 lbs fruits at the rate of $3.50 per lb. How much money should she pay? Certainly it would be $(2.5 × 3.50). Both 2.5 and 3.5 are decimal numbers. 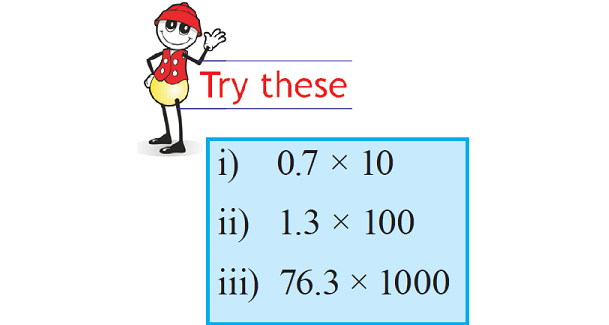 Now, we have come across a situation where we need to know how to multiply two decimals. So we now learn the multiplication of two decimal numbers. Multiplying 15 and 43, we get 645. Both, in 1.5 and 4.3, there is 1 digit to the right of the decimal point. So, count 2 digits from the right and put a decimal point. While multiplying 1.43 and 2.1, you will first multiply 143 and 21. For placing the decimal in the product obtained, you will count 2 + 1 = 3 digits starting from the right most digit. Thus 1.43 × 2.1 = 3.003. The side of a square is 3.2 cm. Find its perimeter. All the sides of a square are equal. Length of each side = 3.2 cm. Thus, perimeter = 4 × 3.2 = 12.8 cm. The length of a rectangle is 6.3 cm and its breadth is 3.2 cm. What is the area of the rectangle? Breadth of the rectangle = 3.2 cm. Thus, she found that depending on the position of the decimal point the decimal number can be converted to a fraction with denominator 10 , 100 or 1000. Now let us see what would happen if a decimal number is multiplied by 10 or 100 or 1000. Decimal point shifted to the right by one place since 10 has one zero. Decimal point shifted to the right by one place since 100 has two zeros. Decimal point shifted to the right by one place since 1000 has three zeros. After having gone through the stuff given above, we hope that the students would have understood "Decimal multiplication".